Shown here are two examples of Bintzler brake shoe racks developed for various certification ( hump) yards. These are simply a means for storing the heavy bar brake shoes used on the retarders. 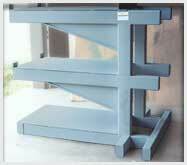 Notice that the three shelf unit has a steel plate welded across the arms. This is for smaller shoes which do not span the arms. Almost any modification desired to these can be made. 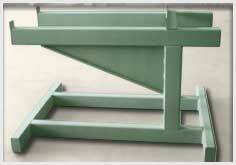 Both units are fabricated from heavy wall rectangular tubing, and can be designed for any weight capacity.